(2 p.m. BST) -- In a bid to become more environmentally friendly, Fred. Olsen Cruise Lines has started to remove single-use plastics onboard its oceangoing ships. In a statement, the line said it will eliminate plastic drinking straws and cutlery, in addition to single-use coffee cups, single-serving plastic jam and butter containers, and plastic laundry bags on its Braemar, Boudicca, Balmoral and Black Watch ships. It is also looking into similar measures for its river ship, Brabant. Additionally, the line will strive to reduce the use of culinary cling film and use rope -- instead of plastic -- to secure loose items during rough weather. "As a cruise line, we make our living out of the sea," said Thomas Rennesland, the line's hotel operations director. We need to do our utmost to conserve this precious environment and make sure that it is safeguarded for marine life and the enjoyment of generations to come. "There are three key elements to the environmental measures that we are undertaking across our fleet: to reduce and – where possible – eliminate single-use disposable plastics; to reduce the amount of plastics used operationally; and finally, to influence our supply chain in their behaviours." Fred. 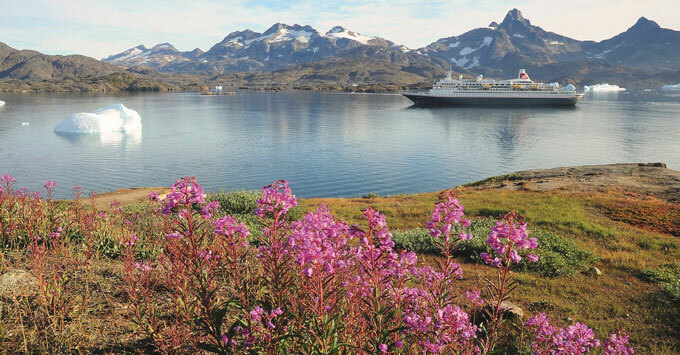 Olsen has joined several other lines including P&O Cruises, in pledging to reduce its environmental footprint by scrapping plastics.